As the final installment of "Unsafe, Uninsured, Unconcerned, and Politically Incorrect," today I want to focus more on the unsafe and uninsured than the unconcerned and politically incorrect. And so, I start you off with a photo of people shooting BB guns at a fair. Nobody's wearing safety gear. The woman has no idea how to use the gun, or load it properly. I've been that lady, recently, in fact, but now our family steers clear of the BB gun shooting booth. That's because at the Jardin d'Acclimation in September, we were unable to load the BB gun properly, having never been shown how. In the process of checking to see if the gun worked, since we couldn't get it right, the young attendant helping us shot sideways towards a wall, at which point the BB ricocheted and lodged itself into the forehead, about an inch above the eye, of a visiting New Yorker. As it gushed blood, I spent a while calming down his hysterical young daughters, assuring them that France has fine doctors. There was no lawsuit, no formal complaint filed, no closure of the booth, though a supervisor did at least come over to figure out what had happened, and waited with him to see if he needed more urgent medical care. When I hand Pippa over to her coaches to ride in a van with them for a weekend competition five hours away, not only do I not sign any papers or releases or medical forms, they do not even think to exchange phone numbers with me. I suggest it ("what a good idea!") and also send Pippa along with some allergy pills, to take as she needs them, using her own then-9-year old judgment. They stay in a gite (country-inn), with the coaches and older kids/young adults in their own rooms. This means the two 9-year old girls stay together in a room on their own. There is a break-in while they are at the hotel, and some money is stolen from the owner's room. The 9-year olds actually see the robbers and therefore get interviewed as witnesses by the police. The coaches forget to mention it to us parents, though the kids certainly are excited by the story and pass it on. Not only do coaches offer to drive their athletes, so do other parents, sometimes without telling us. Our kids are presumed to be responsible enough to make the decision for themselves about which car they get in. Our kids -- and pretty much everybody else's -- are also presumed to be responsible enough to walk to and from school, to take the bus or the metro, and to get themselves to activities. The concept of parental negligence exists, but you'd have to be clearly negligent to be accused of it. For example: leaving your toddler alone on the side of a big highway is negligence. Letting your children walk to and from school, or the park, or their piano class in a familiar neighborhood is not, almost no matter what their age, as long as they can manage it successfully. Yes, even in the heart of Paris. We regularly see children as young as 8 or 9 walking (or scooting) alone, by 10 or so on the bus and metro, and by 14 or so, it's very rare indeed to see a parent taking them to any of their activities. When visiting gymnasts try out, not only do they not pay or sign in, the parents don't even have to stick around if they don't want to. Similarly, at the annual kids' swim party at the neighborhood public pool -- the pool! -- kids sign in at the table by telling the name of their school (it has to be in the correct arrondissement). No ID, no parent signatures, no emergency contact info exchanged. Parents are told to come back in a couple hours. In one shocking -- almost literally -- episode, our group of ten people, including five children, go white water rafting in the Mercantour Park. I don't believe we sign any forms, but they do give us life vests, helmets, and safety training, so really we're already one step ahead of most French endeavors. It was a dark and stormy day, but they send us out anyway. And, it turns out we are in the middle of the river, jumping off rocks and swimming in the middle of a lightning storm. Which is essentially right above us. Much like a swim in a cool river in a rainstorm, the lack of railings, warnings, legal waivers, and "falling off this cliff could cause injury or death" signs is actually quite refreshing. Of the approximately 33 selfie-related deaths world-wide in 2015, amazingly, not one of them was in France. So perhaps the French approach is working: if it looks like a cliff, don't go over it. If it looks like a waterfall, don't go over it. If it looks like an electric fence...you get the drift. Just don't get swept away in the drift. It's like the American national response to almost anything adverse is screaming, rage, or a lawsuit, and the French national response is one massive Gallic shrug: Everyone's still alive, so what's all the hysteria about? Leissa is, essentially, French Feta cheese, made in Provence from raw sheep's milk at the Ferme d'Abriès, in Jausiers, in Haute-Provence from milk from the sheep on their own farm. In order to age it, it's kept in brine for several months. The end result, like Feta, is crumbly yet moist, creamy and salty. 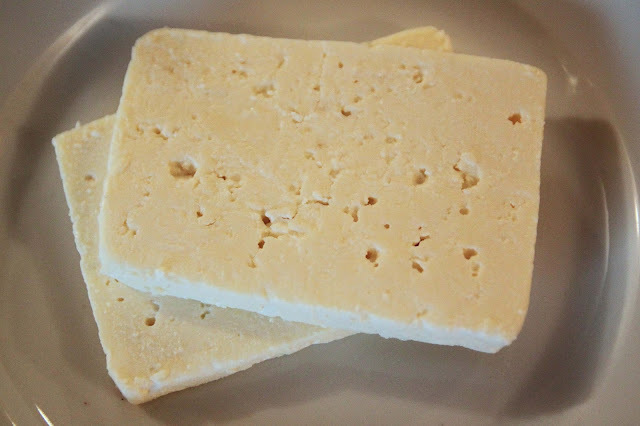 Like the word "Feta", which means "slice", derived from the Latin word "offetta" (diminuative of "offa", meaning "a morsel of food"), the word "Leissa" also is a derivative of a word in some old local dialect meaning "slice". At least, that's what I am told by the cheese-maker on the farm in Jausiers, and I choose to believe her since I don't speak the local dialect. Since all Feta is not the same, it's hard to compare this particular cheese, but Leissa seems to have a slightly fruitier, less sharply salty flavor than most Greek versions of Feta. I buy and eat this Leissa on the very same trip to the Mercantour where we are allowed to white water raft down the rapids and swim in the river in the heart of a lightning storm. We survive both the rafting and the cheese, so I feel that it in this case, the French lack of caution pretty much works out. But mostly, this week's connection is brought to you by a very bad jeu de mot (play on words) in a show of appreciation for the famous French laissez-faire attitude. Cheese-wise, that's fair, right? The cheese is unpasteurized and young, which makes it unsafe and unservable in the eyes of the US government, and anyone who sells or serves it uninsurable, though perhaps it's politically incorrect of me to point that out. So it's good thing I'm in France, eating it with abandon and serving it to my friends in a country where things are more Leissa-faire. If you want a little etymological and historical lesson (and who wouldn't? ), the phrase "laissez-faire" comes from 18th century France, when certain economists argues that seeds and plants should be able to circulate freely among the provinces without imposed duties. In the early 19th century, the phrase came to be used for economic liberalization in general, and the free market. It means, literally, "allowing to do" and pretty much sums up the French attitude in many areas where Americans are seriously over-regulated, especially with regards to choices about personal safety (and just plain common sense). How would you translate it ? " Come on now, stay cool, nobody died ! " ? I love it! And this must be said with a shrug, sardonically raised eyebrows, and a puff of air.